The aim this week was to do some testing with users to gain feedback, and then to narrow down the concepts to a single design. To test my designs with users I refined my top concepts using SolidWorks 3D modelling software to generate more photo realistic images*. I then annotated these to highlight the key features and showed them to a number of potential users. One issue I have been contending with for this product design is that individual parts of each concept can be viewed as standalone components (e.g. 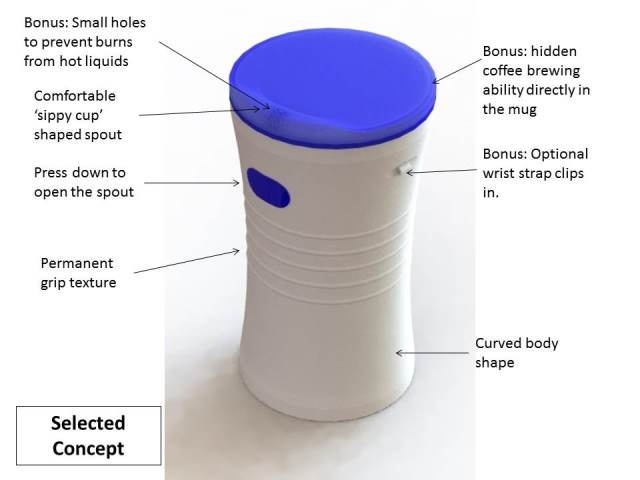 lid, cup), with little influence on other parts of the concept. To get a better idea then for which parts of the concepts are working or not working, I devised a simple questionnaire to ask the users to choose which concept best solves these specific parts. Which would you be most likely to purchase? One Concept to Rule them All...? * My graphic card at home is clearly not so great. An upcoming upgrade should greatly improve the 'realistic' aspect of these images.